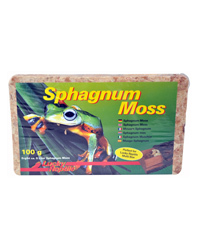 Lucky Reptile Sphagnum Moss comes from controlled cultivation and is from highest quality. It is shipped dried and pressed to a brick to allow long-term storage. If water is added this moss brick will swell up to about 5 litres of fresh and moist sphagnum moss. This moss is excellent for providing humid places inside the terrarium (e.g. hiding boxes for snakes) and it increases the overall humidity inside the terrarium. Excellent for tropical terrariums and most amphibians. This is excellent moss ... I use it for orchids ... long fluffy strands ..... very little else. Good clean material very, very little waste.